Every 100th baby born in Guatemala grows up as an adopted American, making the Central American country the richest source of adoptees in the Western Hemisphere. But U.S. ratification of an international adoption treaty is likely to choke off the supply next summer. Critics say Guatemala has become a baby farm where adoptions are too easy and prone to corruption. Defenders say it offers the children a better future, and that legal corners are cut only to spare Guatemalan women the stigma of unwed motherhood or relieve them of another mouth to feed. For now, willing parents can get Guatemalan babies by paying thousands of dollars to notaries who act as baby brokers, recruiting birth mothers, handling all the paperwork and completing the job in less than half the time it takes elsewhere. The process is so streamlined that Guatemala outpaces all other countries in the percentage of its children put up for adoption in the United States. All this will likely end once the Hague Convention on Intercountry Adoptions takes effect in the United States. The U.S. will then require all foreign adoptions to meet tougher international standards, which Guatemala ratified in 2003 but has yet to implement. "We don't want adoptions to stop but we believe the current system does not provide enough protection to the child's needs," said John Lowell, the U.S. consul in Guatemala. The treaty, also ratified by China, Russia and at least 39 other countries, aims to protect children, birth parents and adoptive parents from abuse, in part by requiring a government agency to regulate adoptions. Guatemala still allows adoptions to be managed privately, without judicial approval. In many other countries, adoptions take more than a year. Guatemala can deliver children in as little as five months. Berta Morales, 35, has given the last five of her 10 children to Americans. "It would have been more of a sin to abort them," said Morales, who lives in Coatepeque, west of Guatemala City. "I'm poor ... but maybe one of them will become a professional." Morales said she was only paid bus fare to Guatemala City, the capital, to sign the papers. But Josefina Arellano, who directs the government office that ultimately approves each adoption, says women who give up multiple children in a row are probably getting paid. "When you look at the time between pregnancies and how many children they have given up, you have to conclude they are doing it for money," she says. "What we're witnessing is a baby factory or farm, dealing with children that should not have been born or put up for adoption." Susana Luarca, a notaries' association lawyer, also denied mothers are doing it for money: "What more help could they get," she asks, "than relieving them of the problem of their child's situation?" Every profession has unscrupulous people, "but that does not mean everything is rotten," added Luarca, who is currently handling 40 adoptions. "Some people have tried to make the case that, just because a business is lucrative, it's bad." It is lucrative: Notaries charge a "country fee" of up to $19,000. With U.S. paperwork and plane trips, the typical Guatemalan adoption costs as much as $30,000, adoption agencies say. But in the last six months alone, the government has brought 30 criminal cases against notaries for falsifying paperwork, allegedly providing false birth certificates and even creating false identities to avoid having to involve the birth father or the parents of underage birth mothers. Applications are surging as parents rush to take advantage of the current process, which will apply to any request filed before the treaty takes effect in mid-2007. Of the 4,100 cases pending in Arellano's office, more than 3,000 were filed this year. Many of these children would grow up Guatemalan if not for the money and the pressure on vulnerable young mothers to give them up for adoption, Arellano said. Defenders say most adoptees are delivered from poverty into loving homes. "There are opportunities that a child could have in education, exposure to cultures, resources that they may not otherwise have had," said Megan Hendy, who directs the Joint Council for International Children Services, representing more than 200 international adoption agencies in 51 countries. Americans have adopted 17,863 Guatemalan children in the last nine years, French couples 1,440, and Guatemalans 576. 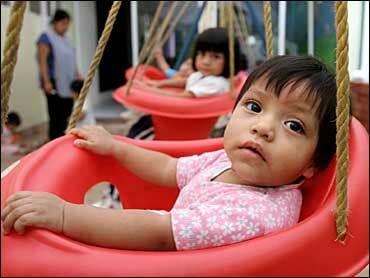 Americans adopted 3,748 of the Guatemalan babies born last year. In raw numbers, Guatemala ranks behind China and Russia among foreign sources of U.S. adoptees, according to the U.S. Citizenship and Immigration Services. But the 7,939 Chinese babies adopted by U.S. couples last year represented just 0.04 percent of that country's total 17.3 million births, and the 4,652 Russian adoptees were 0.3 percent of Russia's births in 2005, while Guatemala's figure is 1 percent. Guatemala also provides the most babies under one year old — at 2,955, it outranked China by 210 babies last year. With half of Guatemala's 13 million people living in poverty, many families struggle to provide for their children, and an entire industry seeks them out. Newspaper and radio ads appeal to women with unwanted pregnancies to consider adoption, and notaries hire people to find birth mothers to meet the demand. "They're like scouts in charge of looking for young pregnant women to convince them to put up their child for adoption," Arellano said. Guatemalan mothers typically hand over their babies to foster parents working for a notary, who get a modest salary and supplies including diapers, milk and access to a private doctor for the child. If false paperwork is exposed, it can create heartbreaking situations. Adoptive parents are usually allowed to keep the babies for a week or more in a hotel while awaiting approval, and sometimes adoptions fall through after the adoptive parents and child have begun to bond. In one case, a birth mother said a notary paid her about $2,400 for her baby boy. "I changed my mind and I want him back," Raquel Ramirez said, according to the court transcript. Many adoptive parents stay at the Guatemala City Marriott, which could pass for a day care center with all the babies coming through its lobby. Katie Quandt, a Minnesota accountant, said she never met her 9-month-old Maria's birth mother, dealing only with a notary. She can only guess the mother's motives. "I think that Maria's mom is a very loving lady and unfortunately doesn't have the financial resources to care for her and that is very sad," Quandt said. "If that's how it is, then I'm so glad we have the opportunity. I think it is an act of love of her to let us share Maria's life." Gary Starr, a psychology professor, also from Minnesota, was staying at the Marriott with his wife while picking up an adopted son. He said no one would tell him how their payment was spent, but it was less than the cost of hiring a surrogate. "I've got to imagine it goes to the attorney, it's got to go to the doctor who is going to take care of the child, it's going to go to the foster parent, it's got to go to the birth mother," Starr said. "I've been told the birth mother gets some fee, I don't know how much. It gets distributed among all these different places. How? I don't know, and if you ask somebody they won't tell you."